Indian weddings like Bollywood movies are grand with a lot of song and dance thrown in. I am a bollywood fan but I have a special love for movies which are set around big fat Indian weddings . The filmy twist to rituals, elaborate jewelery, extravagant lehengas, beautifully choreographed shaadi songs and leading actress dressed in bridal finery all make for an amazing visual experience . When the same bollywood celebrities tie the knot for real, off screen I cant help but compare their real wedding to reel on screen wedding looks and though some bollywood actresses disappoint in their real wedding looks there are some who actually take it a notch higher looking amazingly peppy and elegant. Here I present to you some of the most elegant Real bollywood celebrity brides from which you can take inspiration for your wedding look . Genelia D Souza : The chirpy beauty is one of my favourite bollywood actresses and she just wins hearts with her charming cute smile. Back in 2012 Genelia wed Ritesh Deshmukh in two separate wedding ceremonies, one christian and one hindu looking beautiful in both but it is her wedding reception look which stole the show. Dressed in a peach Falguni and shane peacock lehenga Genelia was a picture of flawless radiance. Her uncut diamond choker, draped dupatta and make up all came together beautifully. I even loved Genelia's church wedding look and her traditional maharastrian Neeta lulla saree look . Dia mirza: I adore Dia mirza not for her acting but for her off screen appearances and her flawless radiant skin. Dia has an amazing sense of style and her glowing make up always gets me jealous. When Dia mirza wed Sahil sangha I was eagerly waiting to see what this diva will wear and I was not disappointed even one bit. While Dia wore a peach gown for her wedding reception it was her Ritu Kumar wedding look in green and beige which I totally loved. Dia's wedding sharara was totally hatke as she skipped traditional wedding colours like red, pink and orange and opted for biege and the addition of pearl jhoomar elevated the look making her one of the classiest bride of recent times. Soha Ali Khan: I am not a Soha ali Khan fan but when her wedding pictures came out I literally dropped my jaw. Yes soha looked that peppy and elegant in her sabyasachi gold lehenga and burnt orange dupatta. Adding more colour to her look was her green necklace and her make up was soft flawless adding to her new bride glow. That Sabyasachi lehenga is stuff dreams are made of, and if I ever get married and can magically afford a sabyasachi this will be the outfit of my choice. Sophisticated classy bling, this is how you do it. 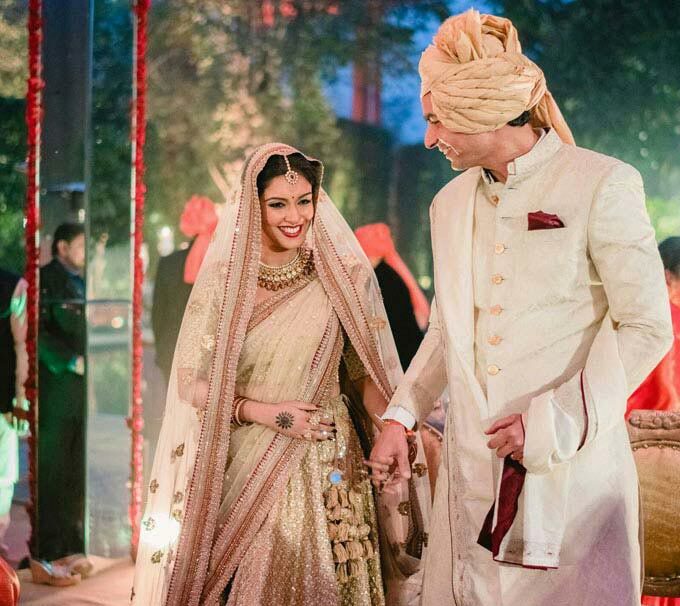 Asin Thottumkal : The most recently married bollywood celebrity Asin looked equally elegant in her sabyasachi on her wedding day when she tied knot to Micromax founder Rahul Sharma. The golden sabyasachi lehenga was beautifully complemented with bright make up and polki jewels. I loved how Asin avoided wearing the usual jhumkas or danglers and opted for studs and went for a bold winged liner. Asin looked splendid without going over the top even while she was marrying a billionaire. 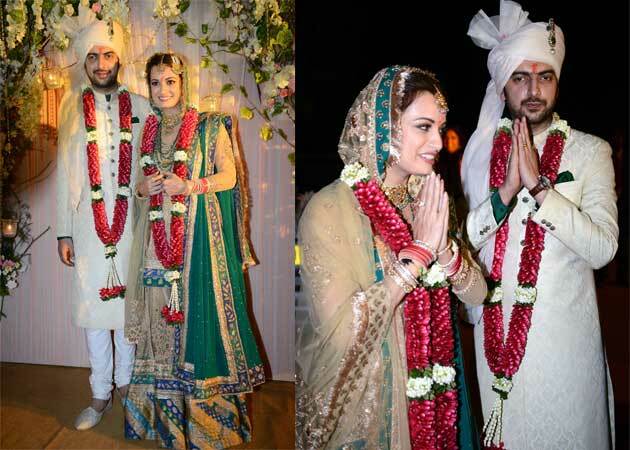 Esha Deol: The Dhoom babe had a dreamy big fat wedding and looked amazing in all her wedding ceremonies. Eshas wedding to Bharat Takhtani was extravagant and she wore a traditional beautiful Neeta lulla red saree, but it was her simple Rocky S reception lehenga look which I loved the best. The light pink lehenga looked classy with right amount of bling and her diamond diamond jewellery with a hint of green nicely fit in. More love to her hair and dupatta drape, this looks straight out of a fairy tale. Who is your favourite bollywood celebrity bride? No doubt dia looks amazing in green!! !